If I let him, he would be outside all day digging in the dirt, building things, and playing with trucks! When we go to playgrounds, sometimes he would rather play in the sand, dirty or wood chips then actually play on the toys and slides! So now that fall is here and the weather is just a little too cool for him to play outside naked in the dirt, he can re-create that scenario IN the house with his new Mining Play Set from Toy State. This Mining Set is a mining-themed ‘Build & Play’ playset and includes 1 free-wheeling Cat machine, and a working rock crusher. My son LOVES the construction site sound effects, music and fun vocal phrases that are also included. 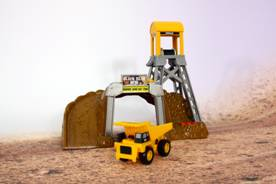 Your child can still play, crush rock and play trucks inside this winter with the Mining Playset from Toy State! It is really affordable and allows a boy to still be a boy this winter! 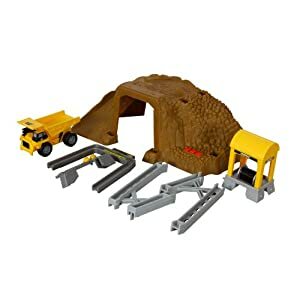 Buy It: You can purchase the Mining Playset for $13.50 from Amazon.com or at Toys R Us, Wal-Mart, Kmart and Target. Win It: Toy State is generously offering (1) CAT Mining Playset to a lucky winner!